The Cowes Outer and Inner Fairways (see Figure 1). The Cowes Harbour fairway is divided into two distinct areas; the ‘Outer Fairway’ and the ‘Inner Fairway’. ‘a)	A vessel proceeding along the course of a narrow channel or fairway shall keep as near to the outer limit of the channel or fairway which lies on her starboard side as is safe and practicable. The Cowes Fairway extends north of No. 1 and 2 buoys, and is referred to as the ‘Outer Fairway’. Small craft should be vigilant for large and regular commercial traffic, which cannot safely navigate outside of the Outer or Inner Fairways, and are reminded again of their duty under Rule 9 of the Collision Regulations; compliance with the Collision Regulations is also a requirement of the Cowes Harbour Commission General Directions. During strong tides and/or winds it may not be possible for some commercial vessels to proceed safely at a speed that is less than 6 knots whilst trying to maintain their required course. This is particularly true in the area between the harbour entrance and the Small Craft Channel. All small craft must comply with Rule 9 and not impede the passage of these vessels. 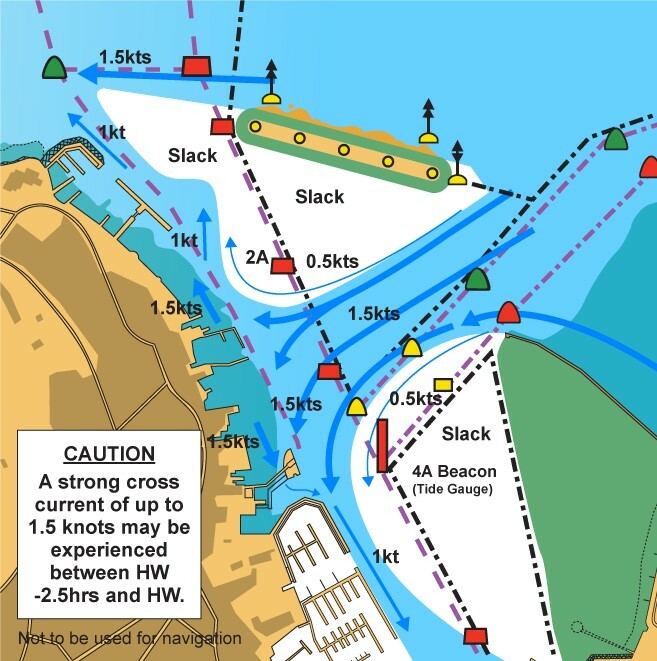 Between HW -2.5 hours and HW-1 hours, vessels transiting the Inner Fairway between the Island Sailing Club and the Small Craft Channel may experience a westerly setting tidal flow of up to 1.5knots, particularly on spring tides; this cross current will have a tendency to set vessels towards the western shore. Small craft, when outbound, should be prepared to alter their heading so as not to be set across the fairway when transiting this area and avoid impeding the safe passage of commercial shipping and ferries. 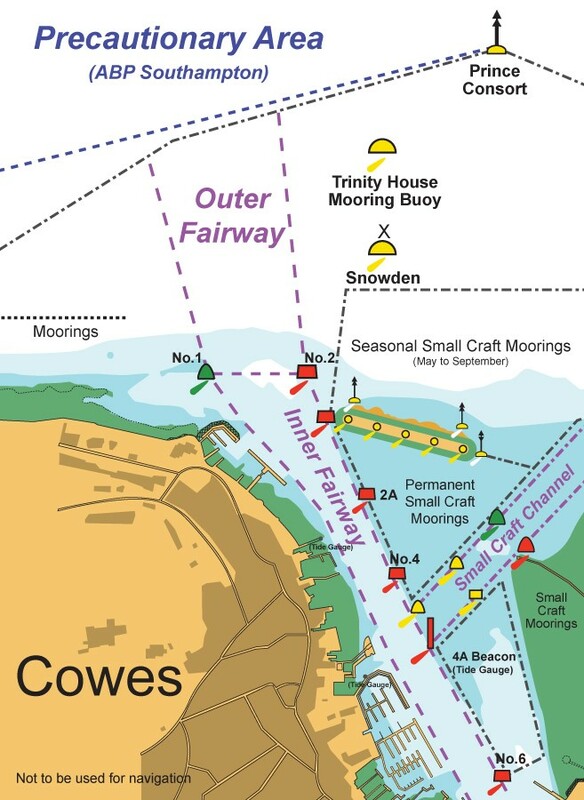 See LNTM: Changes to Tidal Flows in Cowes Harbour for full details. Small vessels, generally less than 20m in length, approaching or departing Cowes from or to the north or east may use the Small Craft Channel (SCC) provided that there is sufficient water in relation to their draught. A tide gauge is situated on the red beacons at either end of the channel. 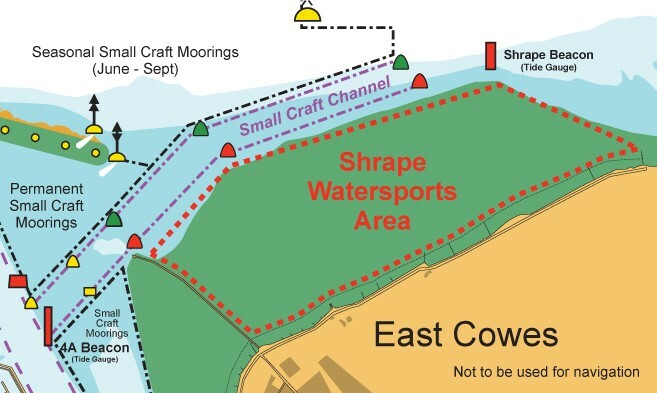 When there is sufficient water, small craft are advised to use the SCC in preference to the fairways, therefore avoiding the main harbour entrance which is used by commercial vessels entering or leaving Cowes and is bisected by the yacht club race start lines. Small craft bound to Cowes from Southampton Water are also advised that it is possible to avoid the Precautionary Area by crossing the Solent to the east of the Bramble Bank, setting a course towards the Shrape Beacon before altering course to the west for the SCC. The difference in distance between using this route and using the main fairway is negligible. Additionally, vessels shall not bypass the Small Craft Channel or fairway approaches by ‘cutting-through’ the small craft mooring areas; such action is associated with much risk because of the concentration of unlit moorings and moored vessels in this area. The Shrape Watersports Area is used by sailing schools for pupils under instruction and should, wherever possible, be avoided by vessels not engaged in supervised activity. A vessel shall not be navigated or manoeuvred in any part of the Inner Harbour or within 100 metres of the shore in a manner or at a speed so as to cause wash to be generated that may cause damage to or endanger the safety of other persons, vessels or property. In addition sailing vessels, if safe and practical, particularly in very light or very strong winds, are recommended to have their engines, if fitted, ready for immediate use when navigating in the vicinity of the Cowes Fairways. All vessels shall when safe and practical give way to the Chain Ferry. Vessels requiring an unimpeded passage must contact the Cowes Chain Ferry on VHF Channel 69 and given early indication of their approach; the Chain Ferry will hold on an agreed riverbank for your transit. The Master of a vessel leaving a marina area or moorings within the Harbour shall give way to vessels navigating within a fairway. The Master of any commercial vessel involved in any collision and any leisure vessel involved in a collision in which significant damage or personal injury is caused shall forthwith and certainly within 24 hours report the collision or incident to the Harbour Master and complete and return the Accident/Incident investigation report to the Harbour Master. No person shall navigate any power driven vessel or sailing vessel fitted with an auxiliary engine within the Small Craft Mooring Area as designated on Admiralty Charts within the Inner Harbour south of the Detached Breakwater and west of longitude 01 17.50W, unless proceeding to or from a mooring located within that area, without the written permission of the Harbour Master. Vessels must not anchor in the fairway, Small Craft Channel, and in any of the areas containing small craft moorings due to the presence of ground chains. These areas are clearly identifiable on the navigational charts for the area.